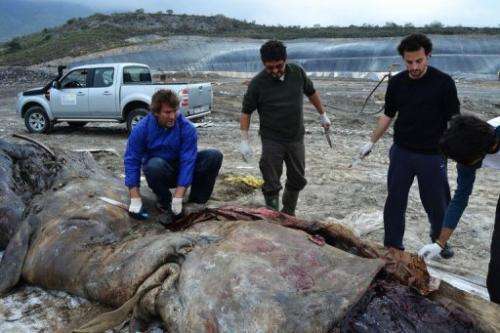 A picture taken on March 28, 2012 and released on March 7, 2013 by the Donana Biological Station which is run by the Spanish National Research Council (EBD-CSIC) shows Renaud de Stephanis (L), a marine biologist, and his colleagues pulling a plastic canvas out of the stomach of a dead sperm whale that washed ashore on a beach south of Granada. A 4.5 tonne sperm whale that washed ashore in southern Spain died from ingesting large amounts of plastic sheets used in greenhouses on farms in the region, a scientist said Thursday. The whale, which came ashore last year on a beach in Andalusia, had over 17 kilogrammes (37 pounds) of garbage blocking its stomach, including some 30 square metres (36 square yards) of plastic canvas, said Renaud de Stephanis, a marine biologist at the Donana Biological Station, which is run by the Spanish National Research Council. "We quickly realised that it had a real greenhouse inside its stomach. We did not expect it, but it did not surprise us," he told AFP in a telephone interview. Over 250 marine animals including turtles, dolphins and otters, have problems because of plastic garbage that finds its way into the ocean and which can cause them to choke, de Stephanis said. Sperm whales, which can be found throughout the Mediterranean Sea, typically feed on squid. The whale that washed ashore in March 2012 on a beach south of Granada, not far from Almeria, was "in a state of advanced emaciation", said de Stephanis. "It was as if it had a rock inside its intestine, nothing could get through. There was so much plastic that it finally exploded," he added. Very few large mammals, including only four sperm whales, have been proven to have died because they swallowed plastic waste, de Stephanis said. The discovery is worrying because it shows that "the sea is full of rubbish" and that waste management systems for plastic, not only in Spain, are not always effective, he said. "These big plastics crumble and the little pieces also go inside fish. And that is what we end up eating," said de Stephanis.